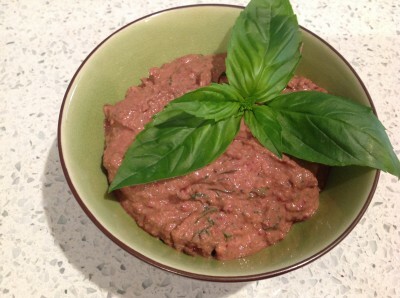 This is a delicious dip to use up fresh raw beetroots. 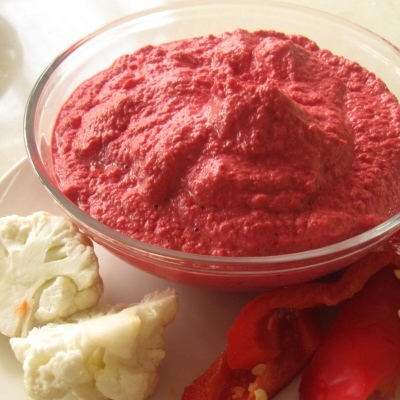 Rather than being bland and mushy, as many cooked beetroot dips tend to be, this one has the crispiness, energy and zing of fresh beets. Give it a try. I’m sure you’ll love it. 1.5 cups raw cashews soaked 2 hours in filtered water then drained. Use a blender or food processor and put the cashews, beetroot, olive oil, yeast flakes, garlic, tahini and lemon or lime juice into the bowl or jug. Blend until mixed but still chunky. Add the basil leaves and blend a little more until combined but still a little chunky. You may need to add up to ¼ cup filtered water if the mix is very thick. I add just a little at a time until I get the desired consistency. Scoop out into a serving bowl. Stir in salt and pepper to taste at this stage. This mix makes about 2 cups of dip and keeps well for 3 days in the fridge.